A harrowing escape from an Alliance ship lands Taymar on a space station controlled by the Shreet. Their goal is to conquer everything in their path including her home planet of Drani, but they need her help to do it. The longer Taymar stays with the Shreet, the more she comes to realize that things are not as they seem. The leader of the Shreet is planning a mutiny and the Drani traitor employed to ensure Taymar’s cooperation may not be a traitor after all. 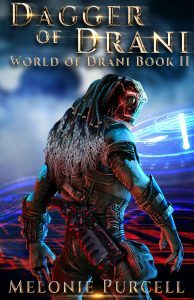 After encountering the Yarnit, another race enslaved by the Shreet, Taymar realizes what Drani’s fate will be if she walks away, yet choosing to help will mean facing her worst nightmare on a world she despises where one false step could cost her life.